A 37-year-old man from Colorado Springs in the United States shot his personal computer to death with a 9-mm pistol due to extreme frustration. Lucas Hinch shot the machine eight times, according to a technology article on Inquirer.net. 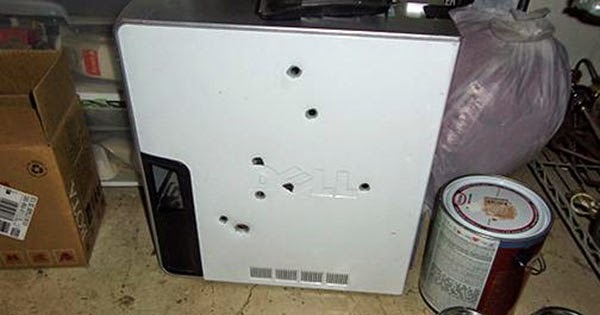 On its Twitter account, the Colorado Springs Police Public Affairs Section posted a photo of the computer's central processing unit (CPU) with bullet holes. Hinch was cited for "discharging a weapon within city limits," the Colorado Spring Gazette reports. "He got tired of fighting with his computer for the last several months," Lt. Jeff Strossner was quoted as saying. "He was having technology problems, so he took it out in the back alley and shot it," he reportedly added. Most likely, Hinch was unaware that "he was breaking the law when he went Wild West on that useless piece of technology." He will be slapped with a penalty to be determined by a judge.